Your brief description attracting me to check my driving skill over there, any how thanks for posting about such a nice place. Driving from Puerto de la Cruz back to Los Gigantes I took a wrong turn and ended up at Buenavista de Norte. Looking at my old fashioned paper map I discovered the road to Santiago del Teide, at night. This took me on what I discovered next morning was the Masca road. Twists, turns, rocks in the road at hairpin bends and visions of tail lights high up the mountain ahead made this a very scary drive in my hire car. No I did not creep along but kept up a steady pace where I could see. Some nice drop off the side moments prevented by a few large boulders in the gaps. The great thing about night driving is you can tell when a car is coming towards you in regions like this. Thank god for old fashioned maps, had I taken a sat nav(GPS) I would never have discovered this road. Sorry it has taken me so long to get back to you, I’ve been globe trotting. Yep, I can see how driving at night would make this road much easier in terms of seeing if any traffic’s heading your way. On the other hand, I’m not sure I fancy those hairpins in the dark! Thanks for the info on the drives(Realtenerifeislanddrives). We may visit again for our 5th wedding anniversary. 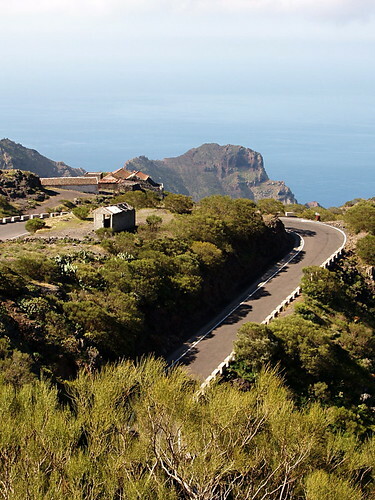 I may do the Masca road in daylight and hire a motorbike to explore the roads to Teide. 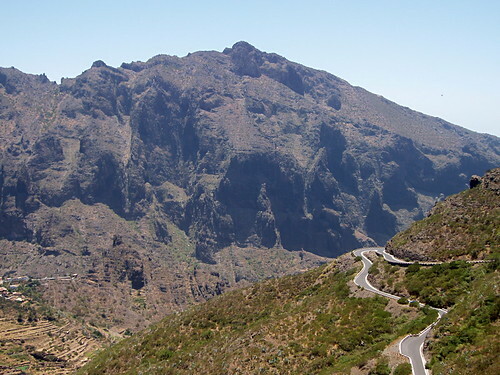 I have just returned from Tenerife (3/3/14) and drove on many of the islands winding steep roads. I hired a medium sized Skoda that had gears and steering suitably matched for the road conditions, and love every meter of it. I drove the Masca road too, and it was one of the holiday highlights! I do agree with Andy Mont’s story, as experienced similar situations, and that’s in the quieter time of the year. My partner and I drove to Masca today and I can honestly say it was an absolutely beautiful valley, but the trip around the mountain somewhat spoilt the lovely experience as it was very scary, I don’t get frightened easily but that road trip was awful, I have never been so scared in my life. So if you have nerves of steel then I would recommend it, but if not steer clear!! We drove the road past Masca in October 1990 when there were no safety barriers or road markings to be seen, just the occasional stone at the side of the road to mark the edge with a steep drop. We had taken a road trip with our two young children around the island and chose this route from a very basic map. As we got up into the hills with a beautiful sunset as a background we realised we were low on petrol. As the dark descended we saw someone in traditional clothing on a donkey (around where Masca is) and met one tourist bus – causing us some angst as it seemed to hang over the edge! Towards the end of our trip, as we reached the lower ground and could see the lights of the main road, our road disappeared and in the pitch black we had a few scary minutes driving through what seemed like a field until it seemed to reappear again! WE got to a petrol station on the main road just in time. That was a memorable trip. We repeated it in 2010 and the road is now much improved, much less scary and with safety barriers. No disappearing road this time, and we made sure to fill the tank! Going to Tenerife in 2 days time and plan to drive there. I am a confident driver how does this compare to the drive to amalfi in the Italian coast if anyone has done both? I drove that horrible road in 1986. I remember chunks of it falling away as we were driving along, and the light was fading. It was absolutely terrifying. I got back to our hotel, had a drink and passed out! Like Metal Rat, I drove that road in a Seat (Yes Se at) in 1985. Not paved, no barricades, huge boulders on the road. Easily the scariest drive of my life by far and I have driven many cliff-side roads in all parts of the world. Now it looks like a nice Sunday drive. 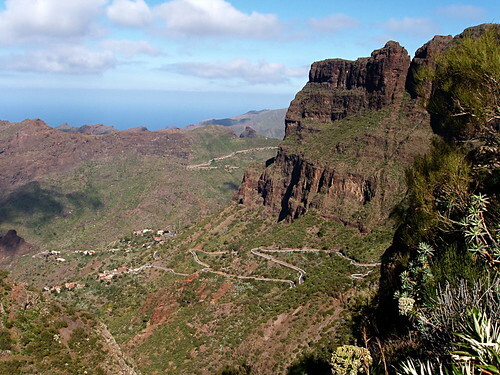 In 1985, there was a sign in Masca that the road was actually closed, the problem is that we came from the other side. Hi, I don’t know if posts are still being seen here, but I was wondering if anyone could comment on the best part of the day to actually arrive at Masca. I have read all the comments about it being very busy during the mid-day hours, esp. 11-3, so would it be better to arrive for sunset? Or does that make the return trip in the dark that much scarier? We have drivern the road to Hana on Maui, and I’m sensing similarities to the hairpin turns on high cliffs pattern…. 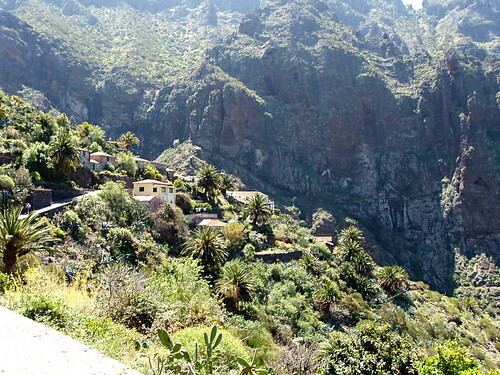 We are in Costa Adeje right now, and I am planning our trip to Masca. Hoping for some much-needed advice… Thank you in advance.